Have you ever sent your little one off to school and they return home with the ‘notice’. That special notice warning you another child in your little one’s class has a discreet hair problem? There I said it. I received a notice yesterday. It’s such a headache and anxiety provoking situation. My child has been exposed to LICE? Sorry, I know I’m making you itchy out there. This is not a nice subject on the ole blog here, I know. But, what I am about to share is nice. It is how I try to prevent catching those hair critters. I’m now more at ease when the notice arrives, knowing my crew has two layers of lice protection on a daily basis. Here they are. 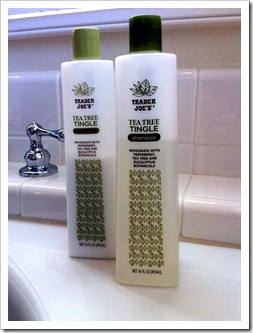 Trader Joe’s Tea Tree Shampoo, Condition and Body Wash. Runs about $3.99 a bottle. Did you know that tea tree oil, sends lice packing if you’ve got’em, and is kryptonite to keeps’em away? 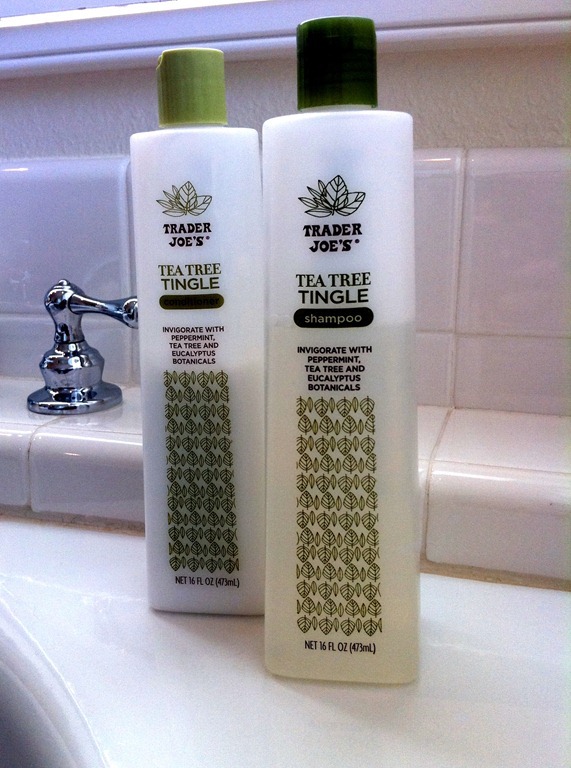 My tribe uses this shampoo and conditioner nightly. It is a sulfate and paraben free, all natural shampoo and conditioner. It smells like winter evergreen air, fresh and clean. 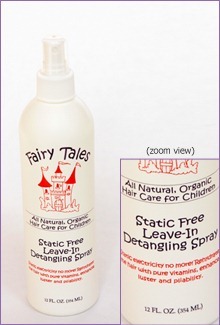 Leave-In Detangler Spray from Fairy Tales Hair. Runs $8.95 a bottle. I use it in the mornings to calm down that bed head or after bathing to detangle. It’s also a natural repellent to those unwanted pests. It smells nice on both boys and girls with its blend of organic oils; rosemary, citronella, tea tree, lemongrass, peppermint, and sage. They also have a line of Shampoo and Conditioners. Check it out. UPDATE: They now carry this product at Ulta, click HERE to see their selection. Honestly, I do still worry when the “notice” arrives. I thoroughly check everybody’s hair to make sure any possible unwanted visitors have not set up camp as requested by the school. So far we have seemed to have dodged the LICE bullet. I believe it is partly or wholly from the products mentioned above. Yeah, I’m still a bit of a neat freak. I also bleach all the sheets and towels, vacuum twice a week, and tell my little people not to share any type of head wear. Have to cover all the bases, right? Psst…. Trader Joe’s and Fairy Tale Hair have no idea who I am. This is not an advertisement in any way. It is just my personal findings I wanted to share, to help you live a lice free life. Peace Out. If you’re a fan of tee tree oil, have you ever tried Melaluca products? I use they kitchen cleansers, dishwashing and dishwasher detergent and all their laundry products. All are made with tea tree oil (the Australian word is Melaluca, hence the name). I love it, it works and it smells good. It is also non-toxic, which is important to me, even though I don’t have small kid do’s. I am not a rep so I won’t gain anything from letting you know, but it is great stuff! Go to http://www.melaluca.com to see all their products. I am on an auto-ship program and get the stuff delivered once a month (my husband uses their vitamin packs for men too and swears by them). Thank you Peggy!!! Great Find. I’ll look into it. I am going to Trader Joe’s right NOW to get these. 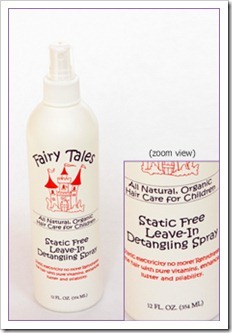 We’ve used the Fairy Tails, shampoo, conditioner and leave-in spray (thanks for the rec. BTW) when we received our “notice”. Thank you for that….so far, so good. (as I slink away from the keyboard, fearing the worst since I said it out loud). Gonna go bleach something now. I feel itchy! I have zapped a few loads with Bleach today myself. Gotta love back-to-school days. Kathleen, do you know of a local location that sells the Fairy Tales hair or do you know the price of shipping on it? I can’t get to the shipping costs without filling out all the information. Thanks!